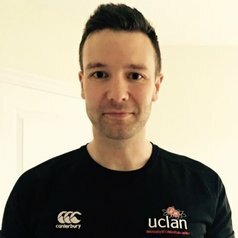 Andy is a Lecturer in Physical Education at the University of Central Lancashire. He is a Qualified Teacher of Secondary Physical Education and is currently undertaking a PhD with the view to enhance the educational value of Physical Education. Sprake, A. and Temple, C. (2016) Physical Education or Physical Entertainment: where’s the education in PE? Journal of Qualitative Research in Sports Studies, 10, 1, 157-176. Sprake, A. and Walker, S. (2015). ‘Blurred lines’: The duty of physical education to establish a unified rationale. European Physical Education Review, 21, 3, 394–406. Sprake, A., Mack, J. and Holder, A. (2014). ‘A world without sport’ in C, Palmer (Ed) The Sports Monograph: Critical perspectives on socio-cultural sport, coaching and Physical Education, pp. 103-110. SSTO Publications, Preston. Sprake, A., Wynne, N. and Wynne, L. (2014). ‘Why do so many girls drop out of sport and physical activity after compulsory education?’ in C, Palmer (Ed) The Sports Monograph: Critical perspectives on socio-cultural sport, coaching and Physical Education, pp. 265-274. SSTO Publications, Preston. Sprake, A. with pupils across Key Stages 3 and 4 (2014). ‘I’ve got my PE kit, Sir, but what else is missing? Perceptions of Physical Education in a Secondary School’ in C, Plamer (Ed) The Sports Monograph: Critical perspectives on socio-cultural sport, coaching and Physical Education, pp. 337-348. SSTO Publications, Preston. Sprake, A. and Walker, S. (2013). “Strike While the Iron is Hot”: the duty of physical education to capitalise on its' compulsory position with a holistic curriculum underpinned by physical literacy. Journal of Sport Science and Physical Education, Bulletin no. 65. Sprake, A. and Palmer, C. (2012). A brief walk through the changing role of Physical Education in the National Curriculum. Journal of Qualitative Research in Sports Studies, 6, 1, 71-82. Clark, S. and Sprake, A. (2011) Fit for purpose? Fit for life? A critical review essay. Journal of Qualitative Research in Sports Studies, 5, 1, 1-8.